President Trump on Thursday threatened to close the entire southern border if thousands of Central American refugees in Tijuana become uncontrollable. “If we find that it gets to a level where we’re going to lose control or people are going to start getting hurt, we will close entry into the country for a period of time until we can get it under control,” he told reporters during a Thanksgiving Day press conference at his Mar-a-Lago resort. “When they lose control on the Mexico side, we’ll just close the border,” he said. Trump noted that the San Ysidro Port of Entry — the world’s busiest land port — was closed briefly on Tuesday. He warned that there would be economic fallout for Mexico if a complete closure occurs. “Mexico will not be able to sell their cars into the Untied States,” he said, apparently referring to the cars assembled by U.S., Japanese and European companies in Mexico. According to figures provided by the Mexican Consulate in San Diego, there are 2,610 Central American refugees in Tijuana and 2,995 in Mexicali. Trump described many of them as “criminals” who are “starting fist fights all over the street” in Tijuana. The President said he has given the military deployed at the border authority to use lethal force. “I’m not going to let the military be taken advantage of,” he said. There was an exchange of tweets Thursday between Trump and Tijuana Mayor Juan Manuel Gastélum, who called for protecting the economies of both sides of the border. 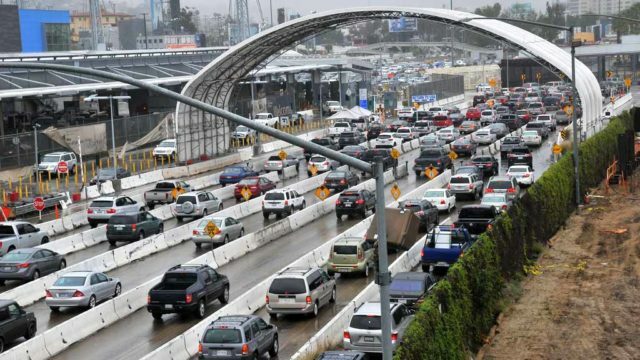 The San Ysidro Chamber of Commerce said in a statement Tuesday that it has drafted petitions to both the U.S. and Mexican authorities to reduce the economic impact of any closures of the ports of entry.